From rose-covered-cottages to lighthouses to grand summer homes, Nantucket’s architecture is a photographer’s dream. This week, I’m sharing my favorite Instagram accounts. Be sure to follow them—and us!—to keep an eye on Nantucket, wherever your travels take you this fall. Dirk and Sharon Van Lieu, the team behind Nantucket Architecture, often seek out some of the island’s lesser-known gems, like this Dionis cottage, to share with followers. As we head into the fall, their off-season photography especially is hauntingly beautiful. Amanda Amaral is a photographer originally from Texas, but has called Nantucket home for more than five years. Her work often includes architectural details, bathed in exquisite light. Follow her to see the island change with the seasons. Grandeur Nantucket photographs (and finds and shares photos of) some of Nantucket’s grandest and most iconic homes–or homes that were stately in their time (like this shot of 6 Gull Island Lane). Follow along for vibrant colors and fun facts about Nantucket’s history. Longtime Nantucket resident Josh Gray’s atmospheric photos will instantly remind you to why the island is called “The Gray Lady.” A writer, too, Josh often combines quotes from literature with his photos. The Orange Street Block | ca 1831 | Rowhouses are a familiar site in many cities, but the Pierce, Easton, Russell, Bunker, & Gardner Houses are the only ones of their kind on Nantucket. Finally, there’s us, the Nantucket Preservation Trust! We love sharing the stories of Nantucket’s unique architectural heritage. Be sure to tag us in your photos of Nantucket architecture so we can see all the great photos you’re taking, too! This letter originally appeared in the 9/13/2018 edition of the Inquirer and Mirror. To the Editor: Few streets in America can transport you back in time like Nantucket’s Main Street, from the grand houses of whale-oil merchants to the humble cobblestones. Recently, the Department of Public Works announced plans for much-needed improvements to upper Main Street, starting with the sidewalks between Winter and Pleasant streets. We commend the DPW, and director Rob McNeil, for turning their attention to this historic streetscape. Improvements to the sidewalks will allow not only visitors and residents with mobility issues but all to more safely navigate our streets and learn about our history. The DPW has taken the time to meet with Main Street neighbors and learn of their specific concerns and hopes for the project. At a presentation on Sept. 6 the DPW revealed plans to reuse original material, and when original material does not exist, some new materials will be distressed to create a timeworn appearance. Concerns about the project remain, however, especially the proposed work to the cobblestone street. Current plans call for removing cobbles and old walkways, excavating, laying asphalt and then relaying cobblestones on top of the asphalt in stone dust, instead of the traditional method of setting cobblestones in sand. Our cobblestone streets immediately convey a sense of authenticity and antiquity and lend heavily to Nantucket’s unique sense of place. The elements that make them special and their quirks should be retained as much as possible. Equally important is the quality. Cobblestones have a very long lifespan, especially when compared to an asphalt surface. 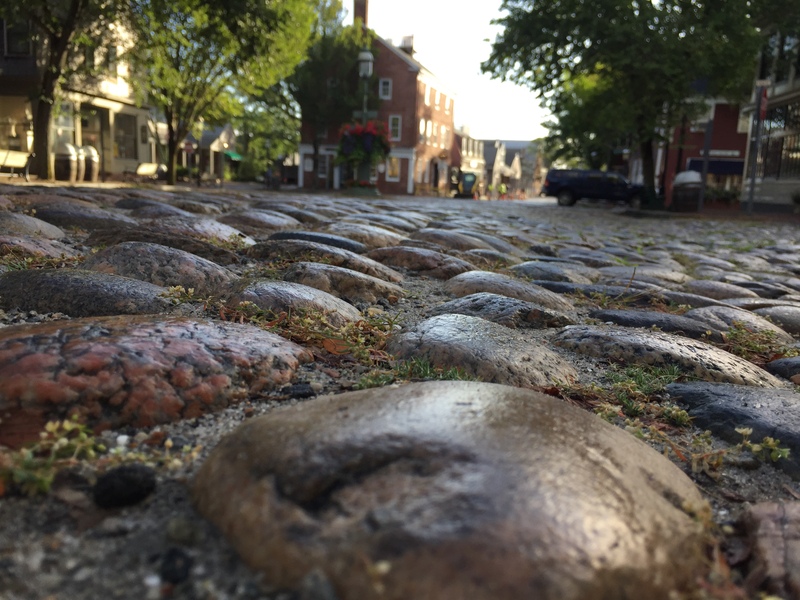 Nantucket’s traditional cobblestone streets – cobbles set in sand – may roll and curve in odd places, but they have the environmental advantage of being a permeable paving surface. This means the cobbles shift with the ground, rather than crack, when they move, and rainwater can penetrate into the ground. For this reason, cobblestones set in sand can help reduce stormwater runoff. This is especially important for Winter Street, which is at a particularly low elevation and already contends with standing water after storms. Early residents of this area – known as the Clay Pits, where clay for bricks was excavated – knew this. Look at the foundations of 86, 88 and 90 Main Street. They are all high above the ground. Cobblestones set in sand also provide our ancient trees with the rooting space they need to grow and flourish. What will happen to these giant elms if the base of the road is excavated and paved over? These trees are a precious resource and best practices must be employed to ensure their survival. We know the season for road repairs is a short one and improvements must be made, but we strongly urge the DPW to continue to work with the neighbors and to rethink the use of asphalt. We believe using this important stretch of Main Street as a testing ground for a new method of cobblestone paving on-island would be a mistake and urge the town to again lay the cobblestones in the traditional method that has worked for nearly 200 years. These cobblestones have been around longer than any of us have. They deserve to be treated with the utmost of care.